Since so many people are beating the dead horse on Ryan Miller being good or not, faceoffs and secondary scoring, it seems justified to use the one game at a time cliché for the Sabres. Buffalo’s current 1-5-1 run has them lurking at the bottom of the Eastern Conference and has stirred up #NotWinninForMacKinnon tweets. The play that has gotten the Sabres to this point has been nothing short of dismal and quite justified for a team at the bottom of the NHL. Tonight’s game in Ottawa is the fourth of five games against the Northeast Division that the Sabres will play in the past ten days. The Senators have continued to ride the wave of solid play that took them to the playoffs last season along with strong support from Craig Anderson. The Sabres, meanwhile are mired in a rut in which their top line has ben nothing short of dominant while the rest of the team is anything but. While Thomas Vanek, Cody Hodgson and Jason Pominville carry the team, the rest of the roster has turned in varying levels of effort over the past week or so. Make no mistake, this is a banged up group of hockey players. 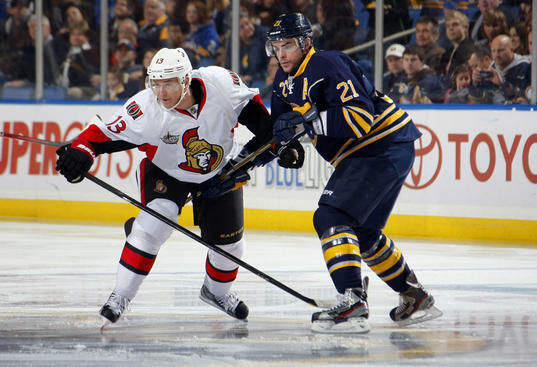 The Sabres, already without Thomas Vanek, lost Matt Ellis and Pat Kaleta during the 4-3 shootout win over the Senators. Today’s game will likely feature one or two fresh faces from the farm. I would assume that Colin Stuart, Derek Whitmore and Paul Szezchura are on the shortlist for a recall. If Cody McCormick and Vanek are able to go, that will obviously change the dynamic a bit. The Sabres are still in the hunt for the final spot in the Eastern Conference playoff race. However, the Washington Capitals sudden surge is making things far more difficult for Buffalo. The Sabres are four points out of eighth place before tonight’s game. That makes every game that much more interesting for tonight. With or without players like Vanek, Kaleta and Ellis, the task is daunting. The Sabres need to continue winning games, regardless of what their opponents are doing. Since teams like Florida and Washington continue to win, there is even less room for error. Expect to see one of my favorite goaltending matchups. Carey Price and Ryan Miller always play well against each other and Miller will need to have another dazzling outing if the Sabres hope to stay alive. The farmhands. Even if Marcus Foligno is the only call-up playing, I want to watch him closely. The Sabres have some interesting players down on the farm, but no superstars. Foligno has just about every trait that Zack Kassian possessed, aside from excellent offensive skills. There are no top-end prospects on the farm as of today, but that will change in the coming years. Let’s see who will be sticking around next year and beyond. The Buffalo Sabres unlikely push for a playoff spot continues to get tougher. While the Sabres are doing their part – 8-3-3 since the All-Star break – they continue to see formidable opponents on a nightly basis. After dispatching the surging Ducks last night, Buffalo is back against another Western Conference foe tonight in San Jose. The Sabres follow tonight’s game with a Saturday showdown with Vancouver, Monday’s game against Winnipeg and another set of Wednesday/Thursday back-to-back games next week. The Sabres are in need of every point available but are in the midst of a stretch that sees them play six games in nine nights. Their last regulation loss came against Philadelphia, also the last game in which Jhonas Enroth started. The rookie was hardly to blame for the loss, but the Sabres need a greater contribution from him if they hope to continue this surge. Despite Ryan Miller’s shutout last night, I would start Enroth today. The Canucks offer no more relief than the Sharks do and Enroth will likely be called upon next week against either the Hurricanes (Wednesday) or the Bruins (Thursday). Knowing how Lindy Ruff operates, Miller will be in net tonight. I would say it is the wrong move, get him some rest now. Miller played the last set of back-to-back games and needs to maintain this tremendous stretch of hockey he is playing. Lindy Ruff needs to find the faith that Enroth instilled in him last season and early this year. Enroth is capable of being a 2A goalie at the minimum in the NHL. Now it is on Ruff to stick with his schedule and let Enroth be that player. The Sabres face a strong Sharks squad that just had one of their young stars traded from the lineup in hopes of finding a little more grit and pugnacity for their own playoff push. San Jose is a deep roster with strong goaltending. 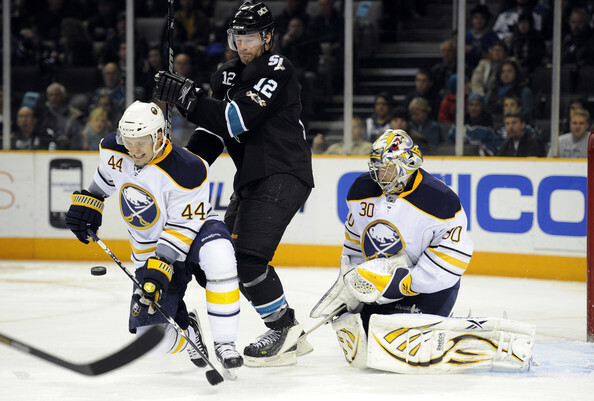 The Sabres saw backup Antero Niittymaki last season, expect to see Antti Niemi tonight. His game is about blocking and simply getting in the way. For some reason the Sabres struggle with these goaltenders. 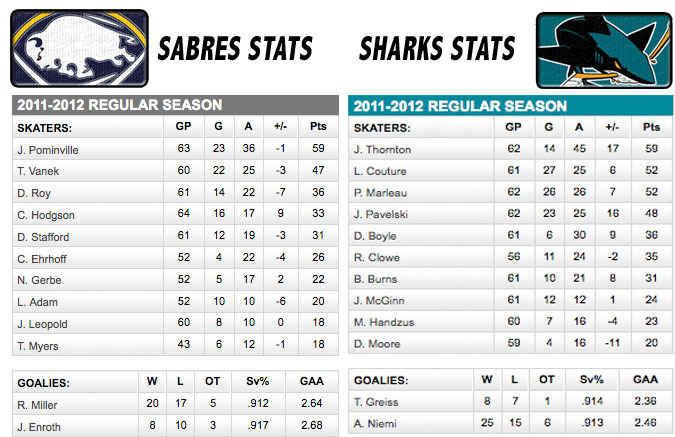 Lindy Ruff vs. Joe Thornton & Co. Buffalo no longer has a formidable shutdown line to match their opponents’ studs. I find it hard to believe that Ville Leino, Nathan Gerbe and Patrick Kaleta are even Ruff’s second choice for a proper checking line. I would think that Robyn Regehr and Andrej Sekera will be the primary duo tasked with matching San Jose’s top line. The Buffalo Sabres have been able to roll together an impressive run of hockey as of late. Looking back to early January, they were on a major skid, couldn’t score goals and weren’t supporting their goaltenders. But as the All-Star break approached they began turning things around. A couple sets of five-game stretches have kept the playoffs within reach and the Sabres can take another step forward tonight in New York. Well, maybe it will be a lateral step. Each team the Sabres are chasing are in action this evening. A pair (Toronto and Washington) play each other. Since Buffalo won’t be able to get too much help in terms of gaining ground, they will need to be content with keeping their head above water. Getting wins last night and Tuesday all but guarantee the Sabres won’t be selling at the deadline. Consider Paul Gaustad safe from any suitors that may come calling. Derek Roy and Drew Stafford probably fall into the same category. Darcy Regier is in a position where he needs to make a few significant moves, but his team is in a position where those moves could potentially be detrimental. No one really knows if the Sabres are buyers or sellers just yet. Most fans would lead you to believe they should be sellers. Many members of the media would likely say the same thing. However, it would appear the verdict is still out down at Seymour H Knox III Plaza. The Sabres sit seven points out of eighth place in the Eastern Conference, the same place they were before their win on Tuesday. As you can tell, this is going to be a difficult journey. Buffalo are well within striking distance of a playoff spot and simply need to continue the run of strong play they have been on since the All-Star break. That evidence alone would lead me to believe that the organization wants to wait before determining what steps they plan on taking on Monday. Tonight’s game will do a lot for that decision. For that matter, tomorrow’s game carries just about the same weight. If the Sabres end the weekend 0-2, they can all but kiss their chances goodbye and begin to retool on the deadline. If they come away with four points – six points for the week – there will be some careful stepping by Darcy Regier and company when deciding in what direction to move. The last time the Bruins came to town the Sabres didn’t wilt under the weight of Boston’s physical game. The Sabres pushed back and showed they’re not completely incapable of standing up for themselves. Of course, the Sabres got handled in all three fights. But they didn’t back down. 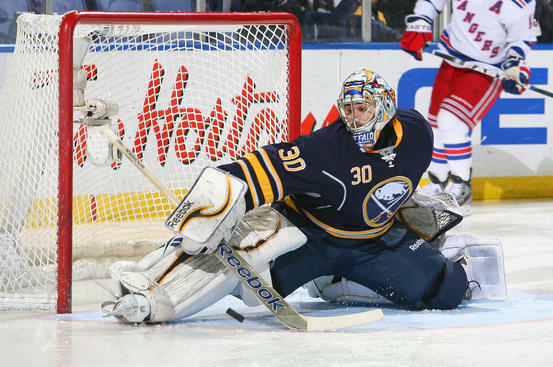 Buffalo also enjoyed some poor goaltending and cruised to a 6-0 victory. I doubt that the Bruins will come with another poor effort tonight and the Sabres will need to be prepared. Ryan Miller has been playing terrific hockey and needs to extend that streak as it seems obvious the team still rolls with his fortune. The bottom of the Eastern Conference is little more than a cluster of teams trying not to make playoffs. Seven points separate eighth place from fifteenth and even the Southeast Division leading Panthers are a point better than eighth at this point. Buffalo are still well within striking distance of a playoff spot, as are the Islanders. New York sits six points behind Toronto and Buffalo is seven back of the Leafs. There is still plenty of hockey to be played, but with the deadline looming you have to wonder how some teams in the East will move forward based on their current roster. The Sabres are stuck in the middle. They’re only seven points out of a playoff spot and could conceivably push that gap to one point if they were to sweep this week’s games and get some help. While that isn’t the most realistic scenario, the ability for the Sabres to snag six points is well within reach. This team did cobble together a short streak of points recently. A strong week would likely set the team up to try and make one final push for the playoffs. Dropping three or more points could potentially set the table for a trade deadline of selling. Personally, I just want to see this team play some strong, consistent hockey. Their last six-goal performance on national television was followed with two average efforts. If this team is serious about making a run, they need to prove their capable of being dominant for a number of games. The Gaustad line vs. the Tavares line. Buffalo made Frans Nielsen look like Gretzky last time these two teams met. His success was mostly thanks to some poor defensive efforts. Buffalo has three points in their last two games, a big part of that has been the success the team has had in shutting down their opponent’s top line. Paul Gaustad is quickly making himself a commodity many teams will want at the deadline and Pat Kaleta and Nathan Gerbe have been effective in their roles. If this line is capable of another shut-down effort there is a good chance of grabbing two points. With only 25 games remaining on the schedule the Sabres welcome the Montreal Canadiens for their first visit to First Niagara Center, this season. After a demoralizing 7-2 loss to Philadelphia last night, the Sabres dim hopes at a playoff berth appear dead. They’re now closer to winning the first pick in the 2012 Draft then they are to playing in the post-season for the third year in a row. The Sabres are currently 27th in the league and would have a legitimate shot at winning the draft lottery. Depending on your opinion on highly drafted Russians will form your opinion on what the Sabres path should be the rest of the season. If there is one thing to take away from this game, it is the fact that Ryan Miller and Carey Price always manage to provide a great head-to-head matchup. For whatever reason the two netminders usually have a good outing when facing each other. So if there is nothing else for you to enjoy, try to enjoy that. Montreal comes in with their own skeletons in the closet. 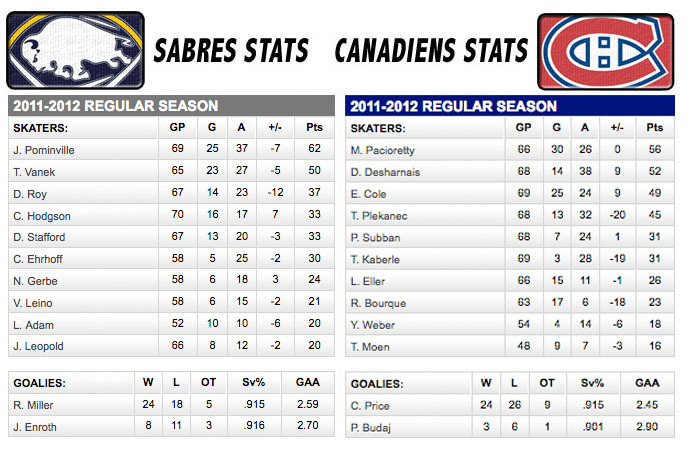 Just as the season has spiraled out of control on the Sabres, the same can be said for the Canadiens. Montreal’s $7m albatross finally scored a goal last week, their coach is being chased out of town for not speaking French and the team can’t seem to piece together many wins. Tonight’s game – and the final two of the season series – will be played for little more than pride between these two teams. It is certainly a tough pill to swallow, but the next few games will be auditions for trades and come with the potential that the roster may be revamped. Paul Gaustad, Brad Boyes, Drew Stafford and Derek Roy. Basically rope just about every available forward into the matchup for tonight. The Sabres are edging very close to sell mode and could potentially clean out a major portion of the roster. The four players listed above have had their names mentioned in different rumors through the year. At this point anyone not named Vanek or Pominville are likely on the chopping block.